After months of hints, innuendo and promises, “The Prepper’s Guide to Food Storage ” is golden. That’s right, after putting in a couple of all-nighters, I was able to complete the final formatting and get my new e-book launched on Amazon. I am both thrilled and relieved – mostly because I know this is an up-to-date resource that will be useful to anyone and everyone that is serious about storing food for the long term. Before I describe the book, I would like to mention that traditionally, when a new book title launches, there is a big hoopla. Reviewers are lined up in advance, websites are flooded with ads, and readers are asked to make their purchase on a single pre-selected date. If all goes well, there is a book bomb (meaning the book is dropped into the public eye like a “bomb”) and the title soars to the top of the rankings. That all sounds great – for someone else. My preference is to take things a bit slower and more relaxed. After all, the information is not going to get tired and out-of-date. But even if it did, I am providing purchasers of the book with a resource page that will include updates, bonus materials and downloads. 4 Like this and want more? When most people start thinking about family preparedness, they focus on food. Not shelter, gear, sanitation, power, self-defense or the myriad of other concerns that need to be addressed following an emergency or disaster situation. Quite simply, food is the number one concern people have second only to their concern for having an adequate supply of water. The Prepper’s Guide to Food Storage is a book about food: What to store, how to store it and best practices. It is a roadmap for showing ordinary citizens that long-term food storage is not something that will overwhelm or burden the family budget. This book is based upon the author’s own tried and true personal experience as someone who has learned to live the preparedness lifestyle by approaching emergency preparedness and planning in a systematic, step-by-step manner. Whether you simply want to prepare for natural disasters or whether you believe the world is headed toward a major food crisis, this book is for you. It covers basic tips and techniques you can use to stock your food storage pantry so that you can be assured that your family will have food to eat, no matter what. If some of this looks familiar, it is because some of the material in The Prepper’s Guide to Food Storage has it roots in previously published articles on Backdoor Survival. In the book, however, these topics have been updated and expanded upon. Plus, of course, there is a ton of new material. The e-book is being sold for $3.99 and if there is enough interest, I will also publish a print version. That said, my focus next year will be to completely rewrite and expand the 12 Months of Prepping series so that it too, can be published on Amazon. I am ecstatic that you have put your trust and faith in my work at Backdoor Survival. I hope you will choose to purchase my book, read it, learn form it, and recommend it to your friends. Enjoy the book – be sure to let me know if you like it. Spotlight Item: The Prepper’s Guide to Food Storage. Need I say more? Bargain Bin: Since were on the topic of books, I did some testing and wrote the foreword in Ron Brown’s The Amazing 2000-Hour Flashlight . This short little e-book will give you detailed instructions for adding a 30-cent resistor to a $5 flashlight and create a light that produces useful illumination for 2000 hours on the same battery. Eveready 3-LED 6Volt Floating Lantern (battery included) : If you are planning to build a 2000-hour flashlight, this is the one that you need. FordEx Group 300lm Mini Cree LED Flashlight: This is a flashlight fav. It is amazing in that it throws a strong beam that can also be adjusted by pulling out the head to create a smaller, more focused light. Because it requires just a single AA battery, it is lightweight and feels comfortable to use in spite of its small size. It even has a clip so you can clip it to a belt or inside a pocket. At the time of this writing, it is under $4 including free or almost free shipping. Coleman One-Mantle Compact Propane Lantern: Easy to use and portable. This Coleman compact lantern lights with matches and is pressure-regulated for consistent light, regardless of weather. The porcelain ventilators will prevent rusting and help this lantern last you a long time. I am pretty excited by the Trekker II Emergency Kits. 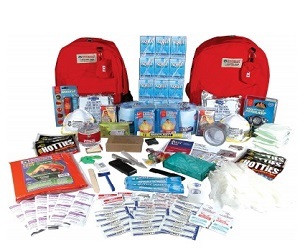 The kit includes 2 packs – one large and one medium – filled with basic survival gear for two people to survive for three days. Don’t let its compact size fool you—it is loaded with basics and even some extras that lots of kits leave out like water purification tablets, sunscreen, and hygiene items to help you feel more comfortable in a crisis situation. The best part is that it is on sale this month for $87.99 or 40% off. Note: Emergency Essentials will guarantee Christmas delivery if an order is placed on or before December 16th. If you live in the West, the guarantee date is even later – up to December 19th in some areas. Click here for a chart showing drop dead holiday delivery dates. Almost Free: I just found this Kikkerland CD401 Classic Survival Tool and ordered one. This is one of those credit-card sized all-in-one tools that includes a saw blade, 2 position wrench, key chain hole, bottle opener, direction auxiliary indication, can opener, knife edge, screwdriver, ruler, 4 position wrench, butterfly screw wrench, and carrying pouch. As of this writing, $1.10 with free shipping. Now that is what I call a deal! Update: the price is now $2.75 with shipping in 2-3 days from the US. I just purchased “Prepper’s Guide To Food Storage”…..and thumbing through it. I’m going to like this. Already I can report that I have a good start but have a lot more to ……organize, and do. Thank you for this easy to understand guide, Gaye!! Love all your articles!! We are senior citizens and try to keep good supply of meds, foods, and other necessities. Thanks for sharing your expertise! It is much appreciated! wow.. that is an easy one.a few years ago everyone thought I was nuts.. for having food storage.. then the job that was once thought to be secure was gone.. no income all we had was what was in savings and what was on the shelf.. luckily I had thought ahead.. and had a nice pantry full of food..
it got us by till a new job was found.. you never know.. when a storm or some other catastrophic event will happen..
We can go without food for 30 days, water for 3 days… I think we need to adjust our approach and make water our #1 priority. That’s all. on March 22nd of each year, Ryan….1 day using 32 oz. in my pantry… I’m good for about 6 months in case of an emergency. The rest of the pantry is stocked with mylar bags of foods that are easy on the salt, and mostly freeze dried. Hope this helps with your “need to adjust your approach with water”, (It helps if you have FOOD TOO!!! lol Best of Lick! Help, please: 2+ gal kitty litter jugs w/ HDPE #2(recycle) on bottom seems would make good H2o storage containers. Also juice bottles (PETE#1) for dry goods storage rice,beans,pasta,flour,sugar,etc. I started storing water in bleach and milk jugs, but switched to litter jugs for quantity. All rinsed thoroughly and decontaminated w/ 10 drops of 6% bleach min 24 hrs, & dryed completely. Water is stored with 10 drops per gal of 6% bleach and 10 drops added every 6 months. Can anyone tell me if my process will work? Okay great. I try not to be as “in your face” as some other sites; it is a balance but sometimes I get it wrong. Thanks for subscribing! IN an emergency you can use the water from your hot water heater. Cut the hose from the washer and attach it to the drain of the water heater. 40 gal of water right there. costs $18. We can shine these from the house and can see across the road. Solar lanterns with a hand crank are a must.